Mr. O’Shea is a life-long resident of Southampton, having attended local schools and graduated from Mercy High School. After graduating from the SUNY at Plattsburgh, Mr. O’Shea attended Brooklyn Law School and graduated in 1981. After graduation he became an Assistant District Attorney in Kings County and prosecuted felony cases there until 1984. In 1985, Mr. O’Shea resigned from his positioning at the DA’s office and founded a law firm in Southampton practicing real estate, criminal law, and bankruptcy law. He has maintained a private practice for the past 30 years in Southampton and has proven to be a formidable advocate for clients as a result of his vast experience in a variety of practice areas. Mr. O’Shea specializes in criminal law including DWI (driving while intoxicated) and DUI (driving under the influence) cases, vehicle and traffic infractions, and a variety of other criminal law cases and foreclosure defense. Mr. Marcincuk is a native and life-long resident of Southampton, graduating from Southampton High School in 1976. He received a bachelor’s degree from Marist College, and a Masters Degree in Business Administration from St. John’s University. After working in the investment industry for several years, Mr. Marcincuk attended the University of Pittsburgh Law School, from which he graduated in 1990. Similar to Mr. O’Shea, he became an Assistant District Attorney in Kings County, and left that post in January, 1995 to accept a position in the Southampton Town Attorney’s Office. 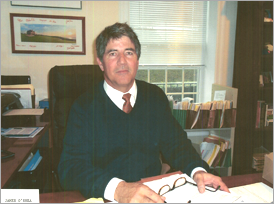 While employed with the Town of Southampton, Mr. Marcincuk represented the Town in various matters concerning land use, environmental law, real property law, real estate, tax certiorari, and litigation matters in which the municipality was involved, while at the same time maintaining a small private law practice, handling mostly real estate matters. 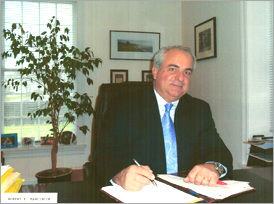 Mr. Marcincuk worked as a Deputy Town Attorney for the Town of Southampton until September, 1999, when he joined Mr. O’Shea in private practice. Mr. Marcincuk’s diversity of experience has made him a valuable asset to the firm and its clientele. He specializes in real estate, land use, wills, estates and trusts, tax certiorari, and landlord and tenant law. His past experience also includes representing banks as a mortgage closing attorney. Mr. Bruyn is the third practicing partner within the firm and is a member of the New York and Connecticut bars. 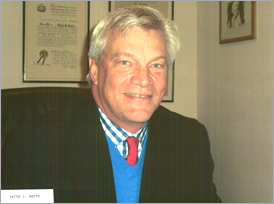 Mr. Bruyn attended Southampton College, and graduated in 1978. After attending graduate school, he accepted a position with the Town of Southampton and worked in the Planning Department until attending CUNY Law School at Queens College. After graduating in 1991, Mr. Bruyn became a Deputy Town Attorney for the Town of Southampton in 1992, and worked in that position until he joined Messrs. O’Shea and Marcincuk in January 2000, when the current law firm was formed. Like Mr. Marcincuk, while employed with the Town of Southampton, Mr. Bruyn represented the Town in various matters concerning land use, environmental law, real property law, real estate, and other municipal matters, and developed a small private law practice representing purchasers and sellers of real estate. Mr. Bruyn’s practice areas continues to include land use and real estate law, and his legal acumen in land use matters is often sought and relied upon by other legal and land use professionals. Bailey L. Ince is an associate attorney who joined the firm in January, 2015. Bailey is a graduate of the Touro Law Center, where he served as the New York Constitutional Law Editor of the Touro Law Review, and had two of his articles published. While in law school, he interned for state and federal judges, the Islip Town Attorney’s Office, and the Civil and Criminal Divisions of the U.S. Attorney’s Office. Prior to joining O’Shea, Marcincuk & Bruyn, LLP, Bailey worked for a sole practitioner in Southampton, preparing legal pleadings and memoranda, appearing in court proceedings for matters related to private lending, real estate transactions, land use and zoning issues, and general litigation cases. He currently focuses on commercial and civil litigation, foreclosure defense, landlord/tenant actions, misdemeanor criminal matters, and vehicle/traffic violations. Bailey attended Adelphi University, where he received his bachelor’s degree. While at Adelphi, he was the Captain and three time NCAA national qualifier for the school’s Cross Country and Track & Field teams.